At the moment there is a team in EmployID working on a competence framework that tries to make competences, skills, abilities and knowledge visible that is needed for coaching and faciliation. This competence framework supports trainings for EmployID Academy as well as EmployID trainings for PES. Clearly for peer coaching there are less skills, abilities, knowledge needed as for individual coaching, since in peer coaching there is no need of a professional coach. The process is lead by peers/ collegues. Still there are some things all peer coaching participants should be able, “trained” at or at least made aware off to improve these skills during their practice within the peer coaching groups. This is a quick an incomplete overview! This term is derived from an unpublished paper of two EmployID consortium members. For peer coaching it means basically that there is a need of being able to develop in certain ways. peer coaching and self-coaching training: This is of course needed to learn about the peer coaching concept, the background and to have the possibility to “try out” and learn within the process. The peer coaching OOC is one possibility to get an overview and to “get going”. Other possibilities could be on-site training, workshops etc. These competences focuses on management and leading within coaching and facilitation. For peer coaching it is mainly on managing and organization of a intervision group and on progress. idea of man: This rests upon Carl Rogers humanistic or client-centered approach. The idea of men there is that the person who searched for help has already everything in it to solve the problem, since he is the expert on the situation and only he can analyze the problem correct to find fitting solutions. This is so important, because it makes clear, that to understand the problem situation, there is much need of listening and asking questions. meeting ethical guidelines and professional standards: In coaching trust is a very important issue. To develop trust there needs to be clear rules and transparency on the way of working. Also, concerning professionalism in coaching, the associations take much value on that. realistic perception of oneself: peer coaching can be a very helpful instrument to learn on oneselfs perception and how others see you. summarising: Summarizing what was said by the client in own words and asking, if that was understood correctly. 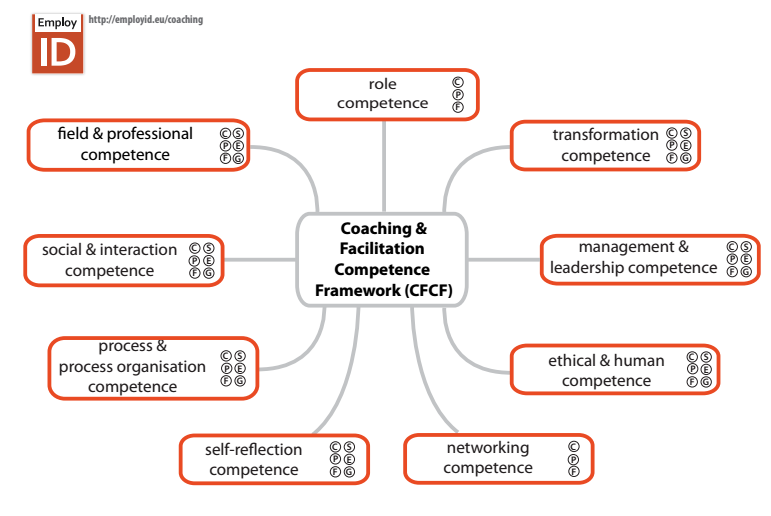 EmployID (2014) Coaching to Facilitation Competence Framework. (not published yet; deliverable for WP 8) based on different sources. At the moment there is no tool for Peer-E-Coaching in EmployID yet. But there are already some ideas. I would suggest we use BigBlueBotton. Are there any concerns or comments? Please let me know! 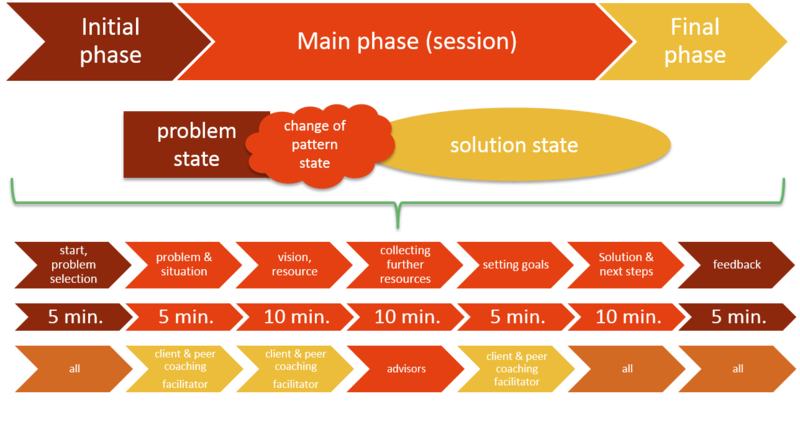 This peer coaching model II is based on the idea that there are shared problems at PES organizations. The problem affects more than one person in the group. But the problem is NOT within the group, e.g. between the group members. The problem affect all persons in the group. But the problem is NOT within the group, e.g. between the group members. To perform peer coaching there is the need of the group members to take in different roles. In this peer coaching model there are two roles: peer coaching facilitator and working group. A minimum group size of 5 people is necessary. In the beginning a more experienced person from another peer coaching group can observe and give feedback to the group. The peer coaching group brainstorms on the core problems that the group has to face in its workplace or their everyday work. After the start the peer coaching group is devided in a working group and one peer coaching facilitator. In the feedback part of the peer coaching concept, they are in the whole peer coaching group again. The working group is on the one hand the one hand the ones answering the questions of the peer coaching facilitator but different from the peer coaching model I they also search together for solutions. Each of the group members is expert on the problem, but there might be different views, ideas, different ways of concentration of a specific part of the problem. The peer coaching facilitator takes the role that a professional coach would take in a group coaching. He asks questions, keeps the time and the process going. The peer coaching facilitator may not give advice. This role could be supported by an e-peer coaching tool to facilitate unexperienced peer coaching facilitators and the whole peer coaching group. The idea behind peer coaching is that in every coaching-session in the peer coaching process the roles change. Everyone in the peer coaching group can take in the role of the peer coaching facilitator. This will be supported by training on peer coaching. For better organization of the group and to introduce possible new members on a later state it can be helpful to have a person in the group who acts as group contact member. This group contact moderates the peer coaching process in the non-coaching-session parts of the initial and the final phase (start and feedback). In general the whole group is responsible for good working processes. The group also should decide together on any changes or new participants. 1. The members in the group commit themselves to keep the confidential information in the group. 2. The members of the group commit themselves to take part actively. 3. The members of the group commit themselves to have a respectful attitude towards the other members and themselves. The group can also set up their own (additional) rules. In the following chapter the structure of the coaching-session in the peer coaching process will be described in detail. The contact person of the group welcomes everybody, problems of group members are collected, a selection of problems for what is urgent and a plan of time is done. Afterwards roles for the peer coaching session(s) need to be assigned (working group and peer coaching facilitator). This should take no more than 5 minutes. Now the peer coaching facilitator takes over the process: The peer coaching facilitator asks the working group about the problem. The working group listens to each other and can make notes (if necessary). They observe mimic, gestures, posture and how the client behaves. They also think of what they feel themselves about the problem and what connotations and mental pictures come to their mind by listening to the other working group members. This should not take more than 10 minutes. And in the end there needs to be a clear definition of the problem in one sentence and with “We” in the beginning. “What is your problem about? What makes it a problem? Who else is part of the problem? What did you already try to solve the problem? The peer coaching facilitator asks of the last time the working group felt enthusiastic about something and helps the working group to visualize the feelings, thoughts, strengths and resources of that moment. This can be a group vision or an individual vision. The strengths can be written down and/or illustrated by the working group or one single member of the working group for a better vizualisation. A helpful tool to support this process could be the resource wheel, mind-map, tree (see below). Every working group members adds their ideas on which strengths and resources that are still needed or which strengths they feel are still hidden beyond. They are asked by the peer coaching facilitator if there are supporting systems like colleagues, superior, friends, other persons, rituals, culture, etc.. The working group can comment on that later on and pick strengths and resources that might be helpful for solving the problem. The peer coaching facilitator also keeps time in this setting. The working group writes down the given information. This may take up to 10 minutes. In this phase the peer coaching facilitator asks the working group what they want to achieve now. The working group formulates a specific goal. The peer coaching facilitator moderates the process if necessary. The possible solutions collected by the group can be written down on a flipchart or else (in e-intervision tool on a whiteboard). Important is to note everything, even if it sounds unrealistic at first. The peer coaching facilitator asks afterwards which solution(s) is/are the most fitting to the working group. The working group can mark the most helpful ones and take at least one step in the next 36 hours. The peer coaching facilitator asks the working group how he will take responsibility on going the first step(s). This may take up to 15 minutes. Everybody of the peer coaching group starting with the working group members explain what they learned for themselves in the process. Afterwards the session is closed and another session can be started. This may take up to 5 minutes. 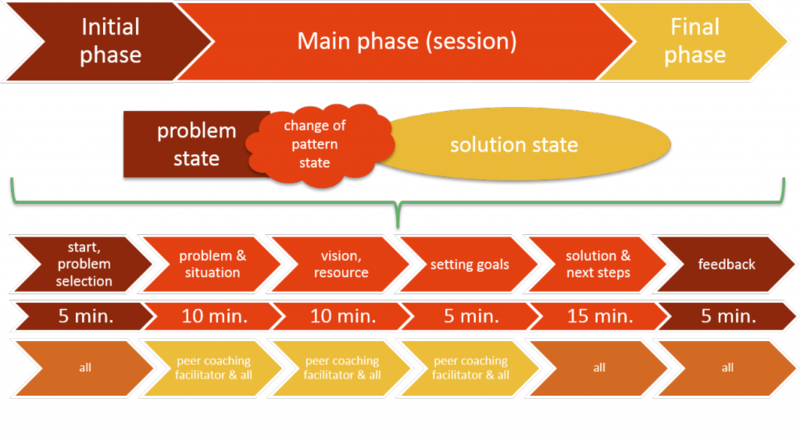 This peer coaching model is based on the classical setting with one individual working on a problem in each coaching-session. This can be completely personal, a problem only the person who is the client concerns. Or it can be similar to problems of others, but transfer needs to be done in personal by the other group members and can be reflected in the feedback phase. To perform peer coaching there is the need of the group members to take in different roles. In this peer coaching model there are three roles: client, peer coaching facilitator and advisors. In each coaching process there is only one client and one peer coaching facilitator but many advisors (the rest of the intervision group members). There should be at least three advisors in order to have a helpful process. This means a minimum group size of 5 people. More advisors are even better, since they all give different and important impulses for the process. In the beginning a more experienced person from another peer coaching group can observe and give feedback to the group. The client is the one giving the problem that is needed to be solved. He is the one answering questions of the peer coaching facilitator and getting advised by the advisors. The client is the expert on his/her problem. The advisors can support the client and the peer coaching facilitator by giving feedback and advice. The idea behind peer coaching is that in every coaching-session in the peer coaching process the roles change. Everyone in the peer coaching group can take in the every role. This will be supported by training on peer coaching. For better organization of the group and to introduce possible new members on a later state it can be helpful to have a person in the group who acts as group contact member. This group contact moderates the peer coaching process in the non-coaching-session parts of the initial and the final phase (start and feedback). In general the whole group is responsible for good working processes. The group also should decide together on any changes or new participants. The contact person of the group welcomes everybody, problems of group members (including head of the group) are collected, a selection of problems for what is urgent and a plan of time is done. Afterwards roles for the peer coaching session(s) need to be assigned (client, peer coaching facilitator, advisors). This should take no more than 5 minutes. Now the peer coaching facilitator takes over the process: The peer coaching facilitator asks the client about the problem. The advisors listen and can make notes (if necessary). They observe mimic, gestures, posture and how the client behaves. They also think of what they feel themselves about the problem and what connotations and mental pictures come to their mind by listening to the client. This should not take more than 5 minutes. And in the end there needs to be a clear definition of the problem in one sentence and with “I” in the beginning. The strengths can be written down and/or illustrated by the client or the peer coaching facilitator for a better vizualisation. A helpful tool to support this process could be the resource wheel, mind-map, tree (see below). This step may take up to 10 minutes. After this step the advisors come into play again. They again listened and are now allowed to help collecting more resources in the next step. In this step the advisors add their ideas on which strengths and resources that are still needed or which strengths they feel the client has hidden beyond. They can also ask, if there are e.g. supporting systems like family, friends, other persons, rituals, places with a certain atmosphere, etc.. The client can comment on that later on and pick strengths and resources that might be helpful for solving the problems. The peer coaching facilitator only keeps time in this setting, writes down the resources and strengths named by the advisors and moderates the discussion (if necessary). In this phase the peer coaching facilitator asks the client what the client wants to achieve now. The client formulates a specific goal and an order to the group, to find possible solutions for achieving the goal. The possible solutions given by the advisors are being collected by the peer coaching facilitator on a flipchart or else (in e-intervision tool on a whiteboard). Important is to note everything, even if it sounds unrealistic at first. The peer coaching facilitator asks afterwards which solutions are fitting for the client. The client can mark the most helpful ones and take at least one step in the next 36 hours. The peer coaching facilitator asks the client how he will take responsibility on going the first step(s). This may take up to 10 minutes. Everybody of the group starting with client and peer coaching facilitator explain what they learned for themselves in the process. Afterwards the session is closed and another session can be started. This may take up to 5 minutes.